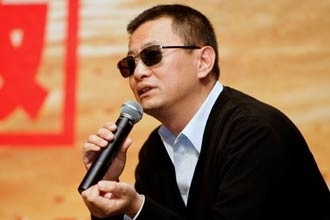 Following on from “The Grandmaster,” filmmaker Wong Kar-Wai has shifted his plans for his next project with an adaptation of short stories by Jin Yucheng entitled “Blossoms” set to be his next film. Blossoms was one of the most popular novels in China in 2013 and was written in “modified” Shanghai dialect – that is, in a way that makes the language more understandable to non-natives. Wong is scripting the film version with Jin which will likely focus on a smaller subset of characters. Wong was originally going to make “Ferryman” next but now only remains attached to that project as a producer. 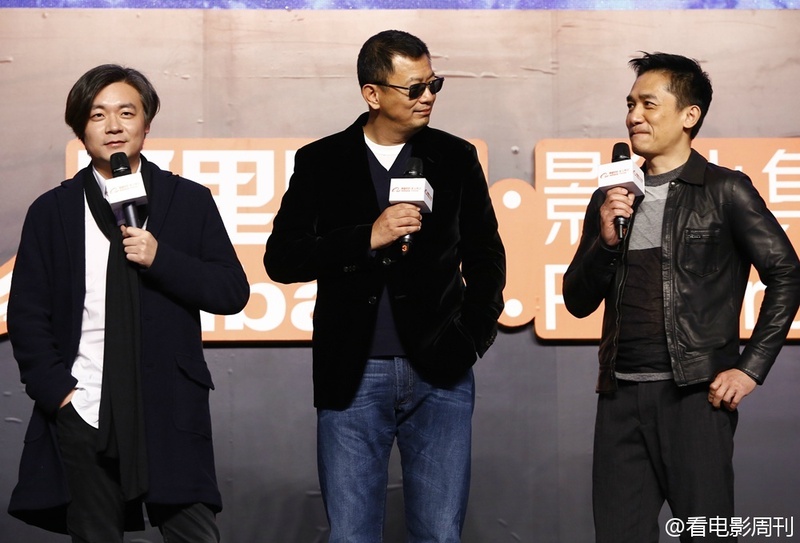 Tony Leung Chiu-wai, Wong Kar-wai and Zhang Jiajia yesterday attended the press conference to announce their new film titled ‘Bai Du Ren‘, translated as ‘Ferryman‘. 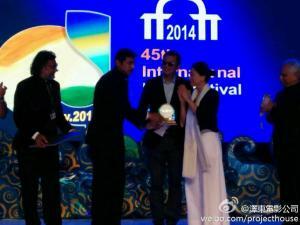 The original writer Zhang Jiajia will direct the film and Wong Kar-wai will produce. The story is part of his 2014 best seller “I Belonged To You.” Zhang Jiajia thanked the team for its support and hoped that the first collaboration with Leung would set off a spark. 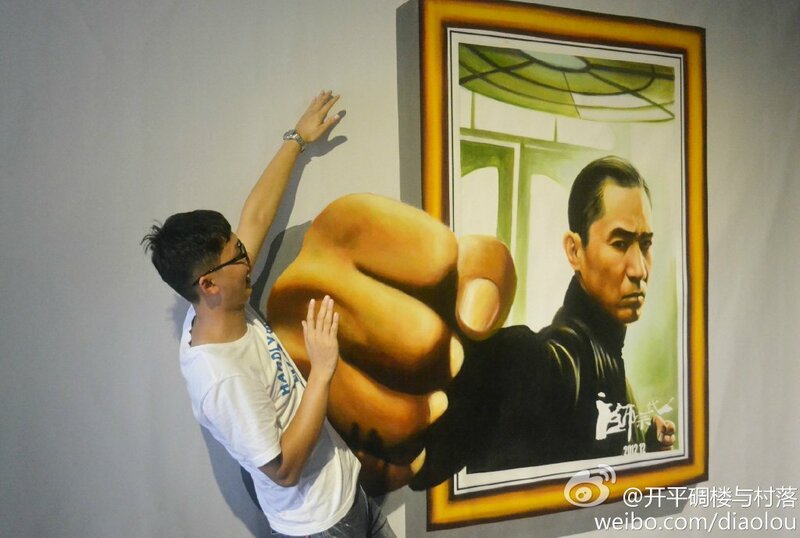 Zhang even “expressed his feeling” to Leung and said that he was the only choice for the new film. Tony Leung said “I took Ferryman because I want to play a romantic comedy.” He said that this time he took the role after reading only the synopsis, so far he still has not seen a script. He fully trusted his frequent collaborator Wong Kar-wai. After ten years without a romantic comedy he said that he had a lot of pressure with the performance. Financial backing is coming from Alibaba Pictures Group Limited. ‘Ferryman’ is the first movie project mainly run by Alibaba Pictures since it was established last year. The movie is expected to be released by the end of this year. Wong Kar Wai‘s first 3D film ‘The Grandmaster 3D’ will open in Mainland China on January 8. Yesterday a premiere press conference was held in Beijing with Bona Film’s chief Yu Dong, director Wong Kar-wai, actors Tony Leung Chiu-wai, Zhang Ziyi, Chang Chen, Max Zhang Jin, Wang Qingxiang in attendance. The director said that ‘The Grandmaster 3D’ returned to the silver screen in response to the audience’s demand. He hoped for the film to be able to bring the audience back to the bygone martial art world with the best appearance and 3D technology. At the event, Tony Leung, Zhang Ziyi, Chang Chen and other stars expressed the unique flavour of director Wong Kar-wai in their hearts. Zhang Ziyi said, “The flavour of director Wong Kar Wai is the flavour of the moment when a match is lit.” Chang Chen described his impression of Wong Kar-wai as whiskey. 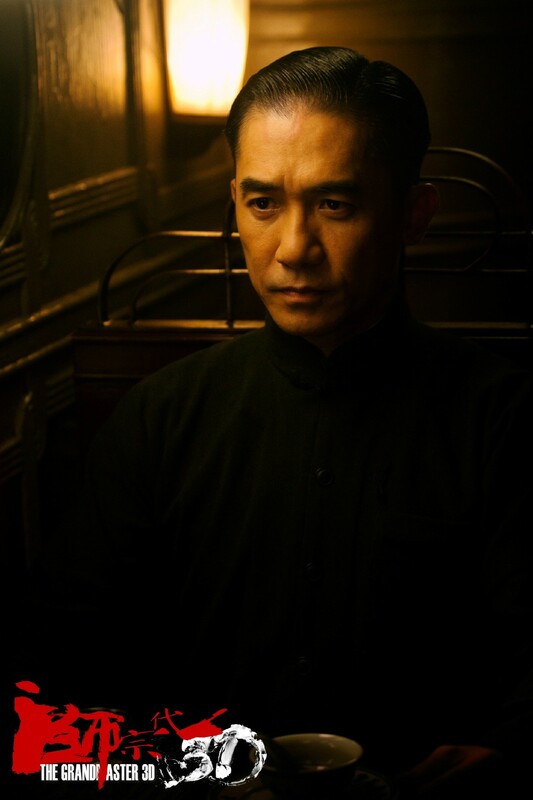 “The flavour is great in the beginning and has a lot that are worthy savouring.” Working with Wong Kar-wai for the eighth time, Tony Leung joked that after the director quit smoking, every time he saw him he had the flavour of chewing gum. Wong Kar-wai made a humorous simile with food. He compared Tony Leung Chiu Wai to tofu, saying that he was “accurate, precise, his acting can be both meat and vegetarian, great both inside and out.” Zhang Ziyi was like a vegetable queen onion, “Spicy and crunchy it is a very northern specialty, but the flavour after maturity is sweet”. 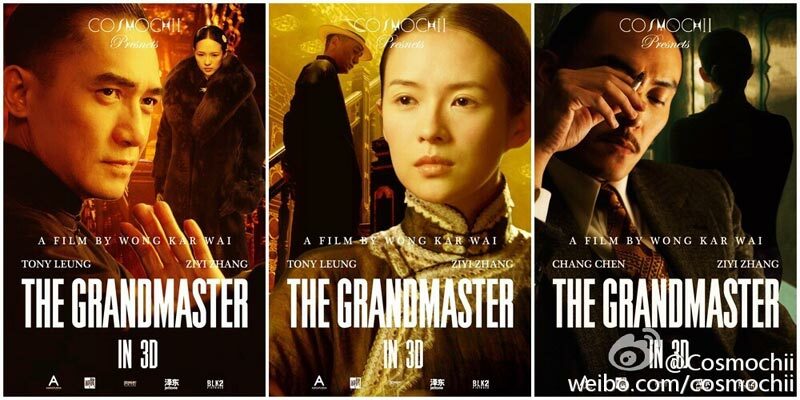 Chang Chen would always be “little fresh meat” in the heart of director Wong Kar Wai, with “the always boiling like water cooked fish” Zhang Jin and the “as masculine as Lao Bai Gan” Wang Qingxiang, ‘The Grandmaster 3D’ was the ultimate feast of 3D sights and sounds. The Grandmaster 3D’s production process took seven years of preparation, over three years of production and a year for the 3D conversion, every drop of which collected the effort of the creators. Tony Leung said that the entire production process was very memorable. When he watched Zhang Ziyi working on the night scene in the Northeast in 20 degrees Celsius below zero, he felt that she truly has contributed a lot. 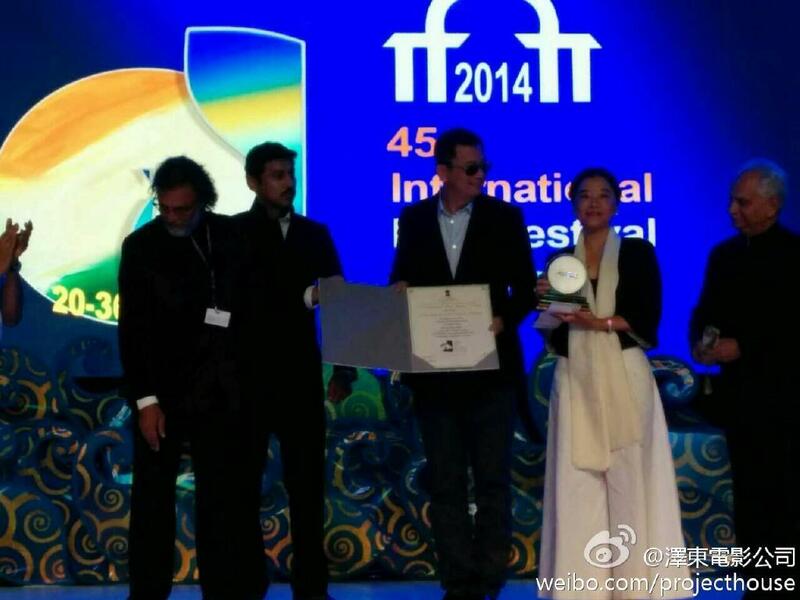 Zhang Ziyi felt that what she got from The Grandmaster 3D already far surpassed what she gave. Working with director Wong Kar-wai she learned to enjoy film even more, and she was very happy to be able to receive his priceless friendship. On the day of the event, Chang Chen even revealed that director Wong Kar-wai would often have inspirations out of the blue, as he kept adding in these new ideas to the film. The director once asked him during his training, “How do you feel if I let Yi Tianxian perform Beijing Opera?” Chang Chen could not help but complain. 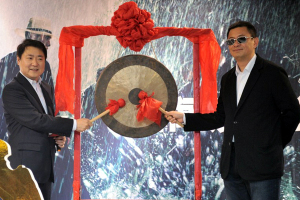 At the press conference, the real reason behind Wong Kar-wai’s sunglasses was revealed. 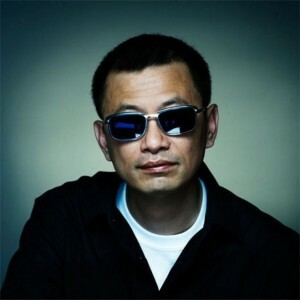 Sunglasses and suits have become Wong Kar-wai’s symbolic look, actually it was the “price” that the director has paid for focusing on film over the years. With long term and excessive use at work, the director’s eyes were very sensitive to light. Thus he would always wear sunglasses. Thus all the stars put on the sponsor’s 3D “glasses” as a salute to director Wong Kar-wai. A press conference for ‘The Grandmaster 3D’ was held in Shenzhen, with director Wong Kar-wai announcing that Tony Leung and Chang Chen‘s duel will appear for the first time, calling it “a shot that is worth more than gold”. Chang Chen revealed that this scene was the final scene shot for the film and the entire process took 90 hours to shoot. 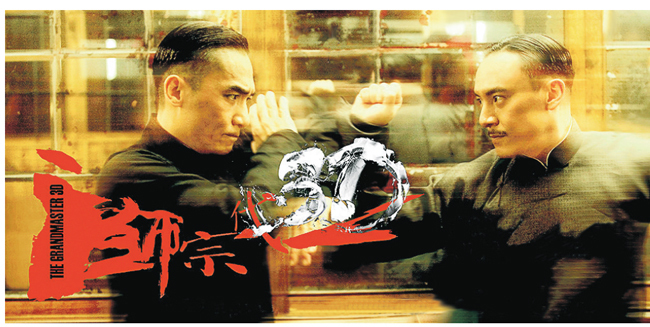 In ‘The Grandmaster 3D’, Wong Kar-wai added the “blade listening duel” between Chang Chen’s Tai Chi Fist master Yi Xiantian and Tony Leung’s Ip Man on Ten Le Long Street. He felt that “a shot that is worth more than gold” also expressed his attitude toward film. 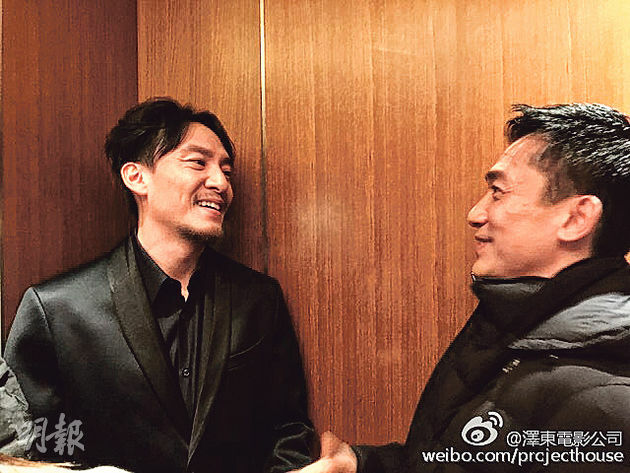 In order to make the duel between two masters Ip Man and Yi Xiantian in its best condition, Chang Chen and Tony Leung did a lot of preparation. The entire scene’s production in the end took 90 hours, finally the mutual admiration from the masters’ exchange was performed to its most thorough. Under Wong Kar-wai’s order, the crew spent two months to take inventory of ‘The Grandmaster 3D’s’ hundreds of thousands of props and finally they were able to find this blade again. 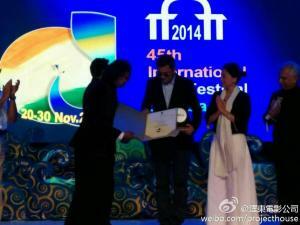 At the event Wong Kar Wai personally presented it to Chang Chen as a gift who brought it to the press conference. 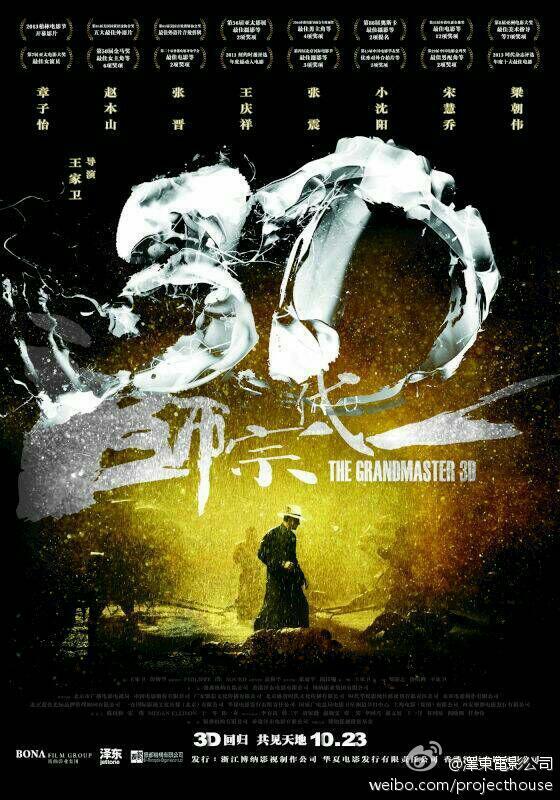 The critically-acclaimed kung fu epic “The Grandmaster” is getting a makeover: its 3D version will open in Chinese theaters on October 23, director Wong Kar-Wai announced at a press conference in Beijing on Sunday. 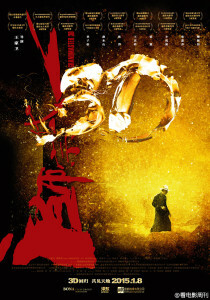 Wong’s Academy Award-nominated martial arts hit will become his first 3D movie. The world-renowned director said he hopes the box office results for the 3D film will surpass the previous 2D edition, which was released in early 2013. The 2D version raked in 290 million yuan (US$47.3 million) at Chinese mainland box offices and has received plenty of awards, including 12 prizes at the Hong Kong Film Awards. But Wong was not satisfied. The director spent a year polishing a 3D version with a team of 200 professionals. He flew to the United States to check the visual effects every month, and the money he spent on making the 3D version would have been enough to produce another brand new movie, Wong said. “When I was shooting the film, I was considering using 3D technologies,” he said at the press conference, “But the technologies didn’t mature and match up with my needs. 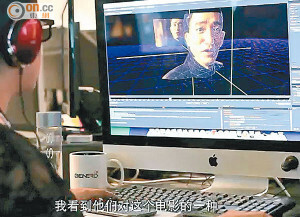 But when I was doing the film, I was doing it with a 3D approach in my mind, so now it is very easy for us to transform it into a 3D format.” It is true that 3D technologies were not mature enough for him at the time, since the film is well known for its long development time – Wong first began preparing it in 2001. Wong said he was trying to take on the challenge of combining Oriental aesthetics and Western technologies through this film. Wong Kar-Wai said that the 3D version will be cut very differently from the previous 2D version, so audiences will see more deleted scenes and new material this time, including an exciting top kung fu performance from female master Gong Er (Zhang Ziyi). Previous media reports said the “special edition” will resemble the cut made for the US market. Actress Zhang Ziyi just received the Best Actress prize for her leading role in “The Grandmaster” on Saturday at the 23rd Golden Rooster and Hundred Flowers Film Festival, held in Lanzhou. The film itself won the Best Film Award. 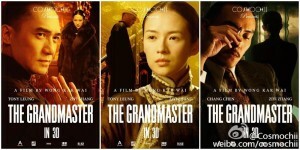 “The Grandmaster” is an epic martial arts drama set against the backdrop of 1930s China and inspired by the life and times of Bruce Lee’s master, Ip Man. 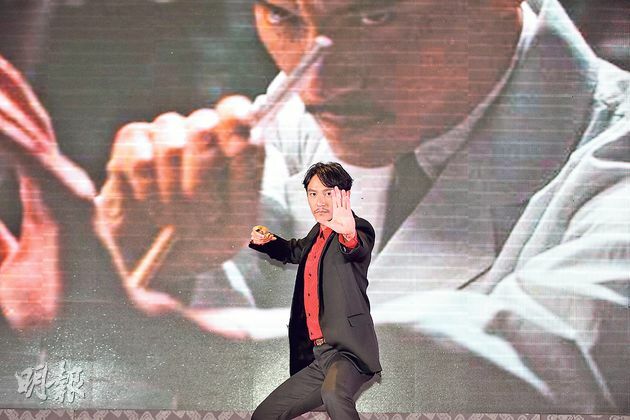 The movie also tells the stories of other kung fu masters in that chaotic and poetic era. The film was nominated for Best Cinematography (Philippe Le Sourd) and Best Costume Design (William Chang Suk Ping) at the 86th Academy Awards. Hong Kong auteur Wong Kar-wai has approached South Korean star Jun Ji-Hyun to star opposite Tony Leung Chiu-wai in his next movie, ‘Ferryman‘. The actress is keen to work with the award-winning Grandmaster director, but is committed to another film project, Apple Daily said. Wong’s shoot is set to start in September in Nanjing, whereas Jun has a shoot at the end of the year for the film ‘Assassination‘. Ferryman is a romance based on a Chinese short story by writer Zhang Jiajia. Jun, who shot to international fame in 2001’s ‘My Sassy Girl’, could play Ah Yu, a young woman who is in love with painter Ma Li, to be played by Leung. Wong is planning to cast ‘Lust, Caution’ actress Tang Wei as Ma Li’s unfaithful former wife, and Taiwanese-Japanese actor Takeshi Kaneshiro as Zhang. A spokesman for Wong’s Jet Tone Films said that filming was to begin later this year, but did not name any of the cast. “I can only say that the actors we are talking to are heavyweights,” she said. Song Hye Kyo, the South Korean actress who played the wife of Ip Man (Leung) in The Grandmaster, had found working with the director difficult. The film was 10 years in the making, and shooting took three years. All the actors said the filming was arduous and Song was said to be unhappy with the time-consuming shoot. The language barrier was also an issue for her, and may surface again should Jun be cast. According to a new report from Hong Kong’s The Standard, Wong Kar-wai will shoot his next film in 2015. Mei Ah Entertainment are producing, with their chief executive Patrick Tong Hing-chi hinting it will be a romantic movie, adding that the main actor is someone “all women are crazy about.” Tong refused to say whether it is another collaboration with Tony Leung Chiu-wai, who has starred in seven of Wong’s eleven movies. 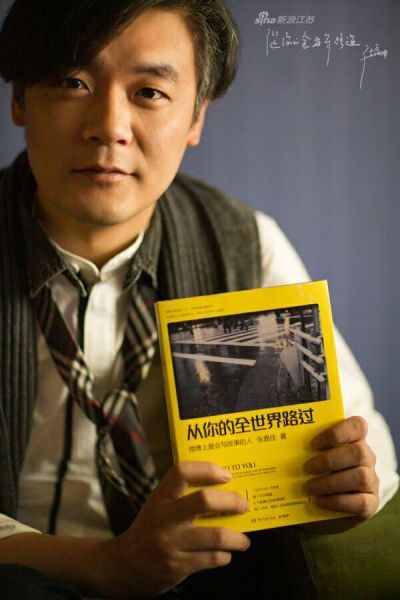 Wong Kar-wai is set to adapt a short story from the collection I Belonged to You 從你的全世界路過 for his next film. Author Zhang Jiajia confirmed the news yesterday on his Weibo microblog. Wong is adapting the chapter called 擺渡人 (literally Ferryman), about an affair between a girl and a married artist in Changchun. Rights for individual chapters of the book have reportedly been sold to other film companies, but Wong’s adaptation is the first that has been officially announced by Zhang himself. According to its publisher, stories from the book have been reposted 1.5 million times on Chinese microblogs. In book form it has reportedly sold over two million copies. Zhang previously co-wrote the script of Wuershan’s The Butcher, the Chef and the Swordsman. Zhang wrote that the film is set to begin shooting soon with a very strong cast. Earlier this month,Mei Ah’s Patrick Tong told local media that Wong was preparing to shoot a romance in 2015. The 33rd Annual Hong Kong Film Awards was held on April 13 at the Hong Kong Cultural Centre Grand Theatre. With the most nominations of 14, ‘The Grandmaster‘ won 12 awards to become the big winner and broke the 9 award records that ‘Comrades, Almost A Love Story‘ and ‘Cold War‘ held. It won Best Film, Best Director, Best Actress, Best Supporting Actor, Best Cinematography, Best Screenplay, Best Editing, Best Art Direction, Best Costume Design, Best Action Choreography, Best Original Score, Best Sound Effects. 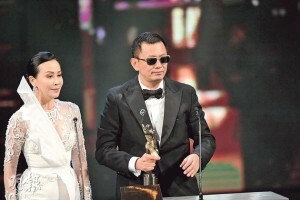 Zhang Ziyi won her 9th Best Actress award for the film while Nick Cheung‘s performance in ‘Unbeatable‘ defeated Tony Leung for Best Actor. Nick Cheung got muscular to make ‘Unbeatable’. 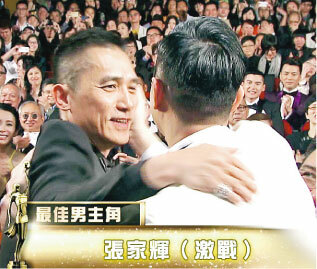 He defeated Tony Leung Leung for Best Actor, his second victory after ‘The Beast Stalker‘ in 2009. However Leung was very magnanimous and took the initiative to congratulate Cheung. After 19 years, Wong Kar-wai finally won the Best Director award again. 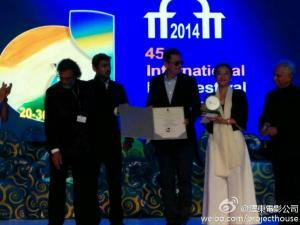 He previously won with ‘Days Of Being Being Wild‘ and ‘ChungKing Express‘. Wong Kar-wai admitted that the road to the stage was not longer, but to get on it again he already took 20 years. Presenter Carina Lau joked that Wong Kar-wai and Tony Leung must really love each other because they both insisted on working with the other. ‘The Grandmaster’ won 12 awards, setting a new record for the most awards. Wong Kar-wai said, “Film is the same as kung fu, it’s about the word ‘believe’. 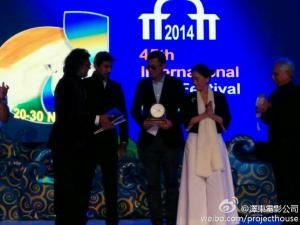 I cheer for Hong Kong film.” ‘The Grandmaster’ also won Best Film. 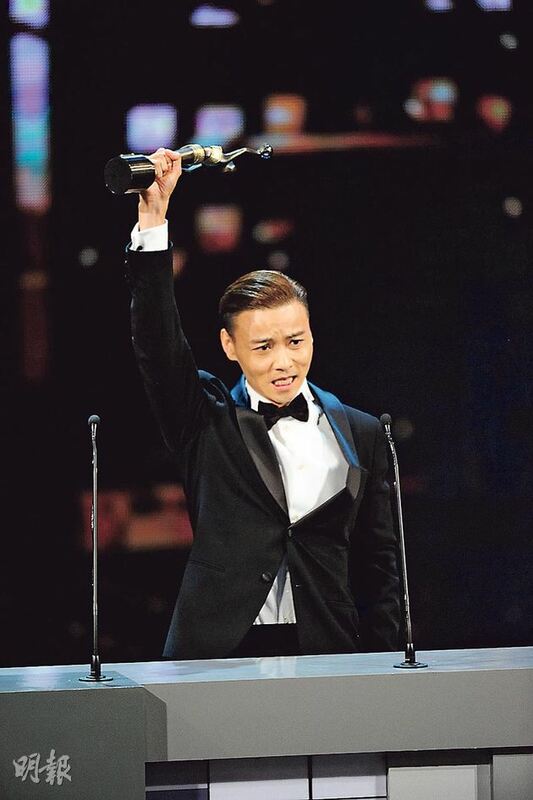 Winning Best Art Direction and Best Costume Design with ‘The Grandmaster’, William Chang has already won the two awards for the 7th time, but due to an injury he could not attend.